UPDATED: Sat., Aug. 4, 2018, 9:39 p.m.
SAN FRANCISCO – Gov. Jerry Brown on Saturday called on President Donald Trump to help California fight and recover from another devastating wildfire season. Brown, who inspected neighborhoods wiped out by a wildfire in the Northern California city of Redding, said he was confident the president he has clashed with over immigration and pollution policies would send aid, which Trump did last year when California’s wine country was hit hard. 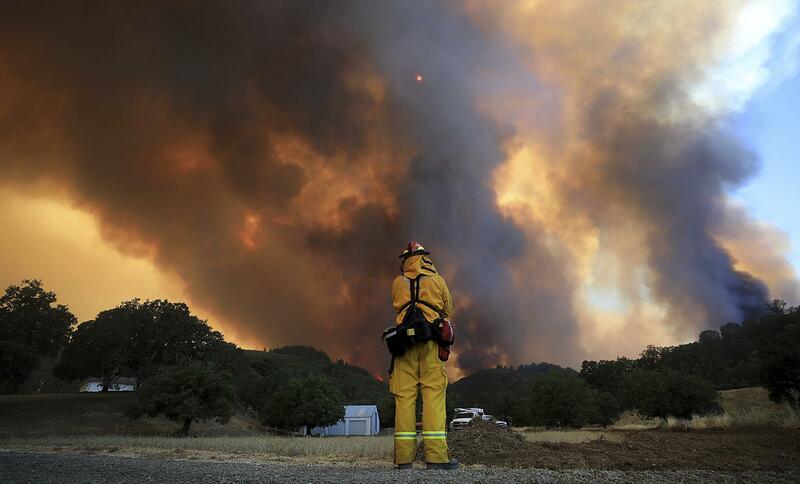 There are 17 major fires burning throughout California, authorities said. In all, they have destroyed hundreds of homes, killed eight people – including four firefighters– and shut down Yosemite National Park. The National Weather Service issued red flag warnings of critical fire weather conditions through Saturday night, saying a series of dry low-pressure systems passing through the region could bring wind gusts of up to 35 mph that could turn small fires or even sparks into racing walls of flames. The fire near Redding, which killed six people and incinerated 1,067 homes, started two weeks ago with sparks from the steel wheel of a towed-trailer’s flat tire, Department of Agriculture and Fire Precention officials said. It burned so furiously on July 26 that it created what is called a fire whirl. The twirling tower of flame reached speeds of 143 mph , which rivaled some of the most destructive Midwest tornados, National Weather Service meteorologist Duane Dykema said. The whirl uprooted trees and tore roofs from homes, Dykema said. Published: Aug. 4, 2018, 2:47 p.m. Updated: Aug. 4, 2018, 9:39 p.m.